제12회 서울재즈페스티벌 2018 블라인드 티켓이 매진되었습니다. 블라인드티켓에 관심가져주신 모든 분들께 감사드립니다. 서울재즈페스티벌의 열두 번째 스토리에 끊임없는 사랑 부탁드립니다. 예매가 마감되는 시점까지 취소표에 한하여 예매가 가능합니다. 무통장 입금으로 예매한 예매자분들은 부여받은 가상계좌로 입금마감시간까지 입금을 완료해주셔야합니다. 12월 4일 밤 11시 59분까지 입금하셔야 합니다. 입금마감시간까지 미입금된 경우는 예매가 자동 취소됩니다. *은행 전산 마감시간에 따라 밤 11시 이후에는 입금이 불가능한 경우가 발생할 수 있으니 유의하시기 바랍니다. *이후 티켓오픈 일정은 추후 공지될 예정입니다. 계속해서 많은 관심 바랍니다. 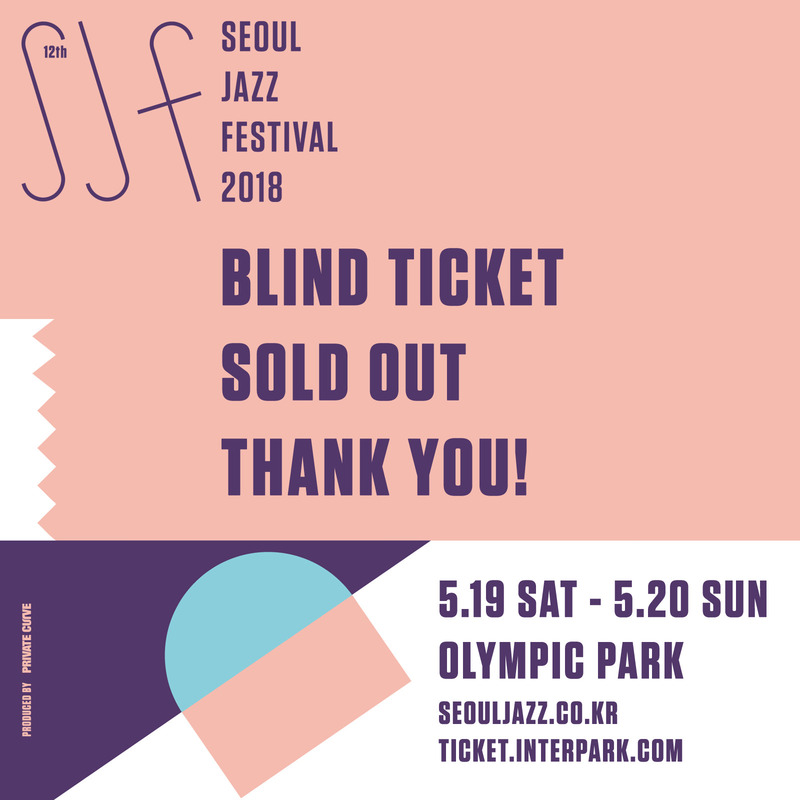 Blind tickets for the 12th Seoul Jazz Festival 2018 have been sold out. Blind ticket booking page will close at 23:59 on December 4th, and until then you may purchase any cancelled tickets that become available. If you selected wire transfer payment, you must wire the amount to the bank account information received in time in order for the transaction to be completed. *Any purchasers who used wire transfer method to book tickets on December 3rd must wire the money to the instructed account number by 23:59 on December 4th. Failure to do so will result in automatic cancellation of the ticket. *Please note that depending on your bank system wiring money after 23:00 may be unavailable. Please be sure to check with your bank ahead of time. *Additional ticket open dates will be announced soon.